The moon turns blood red in this 3:30 a.m. ET view of the total lunar eclipse on April 15, 2014 as seen by a telescope at the University of Arizona's Mt. Lemmon SkyCenter at Steward Observatory atop Mt. Lemmon, Arizona. On Sunday (Sept. 27), skywatchers across the United States will be in for a special treat: The full "supermoon" (a full moon when the moon is closest to Earth in its orbit) will go into eclipse. A lunar eclipse occurs when the moon passes into the shadow of the Earth. There are several "flavors" of eclipse. A penumbral eclipse happens when the moon just grazes the thinnest part of Earth's shadow. If the moon partly goes into the shadow, observers see a partial eclipse. 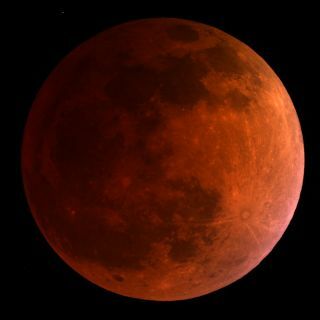 A total lunar eclipse is the most spectacular of the three: The moon goes fully into the shadow and appears either red or brown. "During a total lunar eclipse, white sunlight hitting the atmosphere on the sides of the Earth gets absorbed and then radiated out (scattered). Blue-colored light is most affected," NASA officials wrote online. "That is, the atmosphere filters out (scatters away) most of the blue-colored light. What's left over is the orange- and red-colored light." The light through Earth's atmosphere then falls onto the moon. NASA notes that the red light seen during a lunar eclipse is much dimmer than a typical moon's light. That happens because the red light is reflected back to Earth, and it is much dimmer than the white light the sun usually shines onto the moon's surface. The moon turns different shades of red, orange or gold with each eclipse. That's because the shade of the light reaching the moon depends on what is in Earth's atmosphere (the amount of water and particles), as well as the atmosphere's temperature and humidity, NASA wrote. For example, a recent volcanic eruption could send more particulates into the atmosphere, further darkening the moon during an eclipse. Editor's Note: If you snap an amazing picture of the Sept. 27 total lunar eclipse and want to be featured in a story or gallery, you can send photos, comments, and your name and location to managing editor Tariq Malik at spacephotos@space.com.